It is my pleasure to host the Limited Supply Challenge on Splitcoast today. Late last night, Jen called me and asked if I could fill in as hostess. 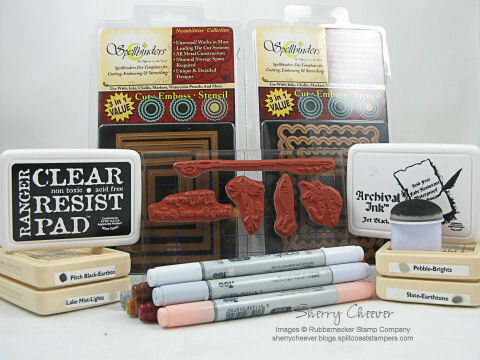 Luckily I had been in the stamp room working on another Rubbernecker sample for the Akron Show, and could come up with something quick. Jen usually posts at night, and I didn’t want to keep the Challenge Chasers waiting. The images were stamped on white rectangles cut with Rectangle Nestabilities and then colored with Copic Markers. The edges were sponged with Adirondack Slate and then mounted on black Scalloped Rectangles, also cut with Nestabilities. 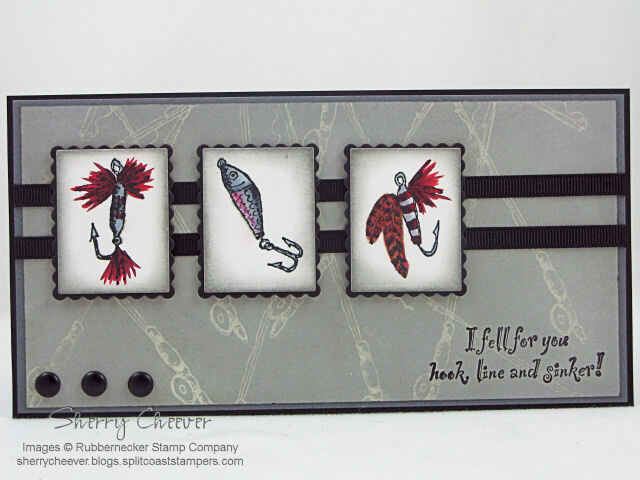 The background panel was made by stamping the rod and reel in Ranger Clear Resist and then layers of different shades of gray inks were added with a sponge dauber. I hope ya’ll have a great day today!